This is a chance to introduce children to the basics of First Aid and life-saving – including learning CPR skills and how to master using a defibrillator. The course is aimed at children from 8 upwards but can be tailored to children of any age, with no use of confusing terminologies. 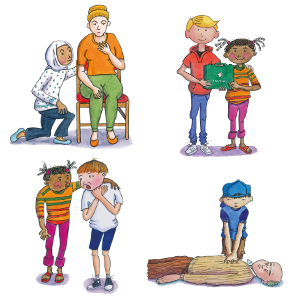 The course is tailored to each child’s ability and is fun and educational, with plenty of opportunities for practical exercises, to help children understand the importance of staying calm in an emergency and helping someone who is poorly or injured. The course, which starts from just £15 per child, can be tailored to suit your timetable, dependent on the syllabus you want covered, but ideally should last no less than two hours. We recommend around 3 hours, or a half day session, with a short break. This is a non-regulated qualification and all children will receive an attendance certificate. They will also be provided with a test worksheet if required.